We started TLS, True Love Stories one year ago in June 2013 with the idea of providing quality videos with fuss free approach to wedding couples who wants to have their wedding day captured on video. With many wedding videography Singapore companies in the industry all over the world and information being readily available to everyone, the competition has made choosing the right wedding videography company favorable to the consumers of today. Despite being favorable to today’s consumers, we always cannot emphasis the importance of finding the favorite actual day photographer and videographer immediately after settling on the wedding date as they may or may not be available for you. Before starting TLS, True Love Stories, we have been filming weddings for many years and we understand what most wedding couples need from their wedding videography services that they engaged and thus we came out with the 2 packages for the actual day wedding videography services. We are very blessed to have many past TLS, True Love Stories clients and friends that recommend us to their friends who were also getting married over the span of the year despite our little marketing effort except through our facebook and my personal friends’ referrals. We were also successful in our one day wedding fairs at Fairmont Singapore to be able to have our branding reach out to couples visiting the fair and having them signed up with us after the show. 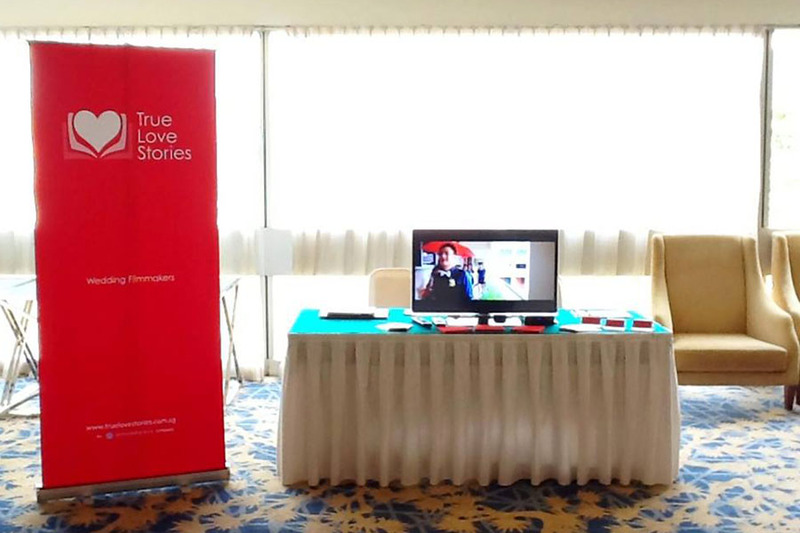 Photo of our booth at the first Fairmont Wedding Fair that TLS, True Love Stories participated in. Please do like us on our facebook page at https://www.facebook.com/TrueLoveStories to receive updates from us on our coming wedding fair shows or our latest wedding films. Today at TLS, True Love Stories, we have evolved our webpage and with the same offerings to our wedding clients, we now offer our 100% money back guarantee. Our wedding clients will be notified by the 10th working day after their wedding day that their wedding film will be ready for collection on the following working day after notification otherwise we will refund 100%. As we know that wedding couples would like to re-live their wedding day as soon as possible, we offer this guarantee that you will be able to receive the final film without waiting for months for it to be delivered. Spread the word and you or your friends who engaged us may have our services for free if we aren’t able to deliver our promise.